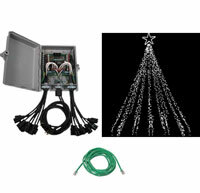 The Mega Tree Add-On Package allows you to add a Mega Tree to your existing WowLights/Light-O-Rama Christmas display. Timing for the Mega Tree available in all Christmas Sequences. Note: Package requires Computer with Light-O-Rama Sequence Editor Software, RS-485 Adapter, Lights, and Extension Cords.